raised || by || cassettes: Music Review // Patrick Ames "All I Do Is Bleed"
"All I Do Is Bleed"
This EP consists of four songs and it's such a trip. Musically, the style can change from song to song but still stay within that same overall genre where you feel like it's rock but don't really know who exactly to compare it with and that's also cool. Right away, this has clapping and feels like Jimmy Buffett or Jack Johnson, which also makes me think of that Flav Martin & Jerry Marotta CD I reviewed once not so long ago. 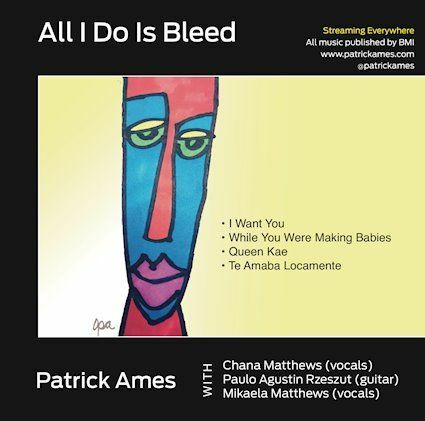 On the first track it just feels like such a specific sound that it has to be done the correct way or else I end up not liking it but Patrick Ames hits every note perfectly. There are these great backing vocals, complet with this "bu bu bu bu bu" type of thing going on and I almost dare to call it soft rock but I don't know enough about the genre to be sure enough to use it. Acoustics and lots of words start the second song, which is called "I Want You" but has the title sung in it and I think that's cool. I don't mind titular tracks, but I always like when the title is hidden away in a non-titular track as well. There is a gritty feel to this, it's very raw and then on the third song we're swept away by the passion of what could be compared with Desperado or perhaps salsa music. Though the words are in a language which I do not know, I still find myself trying to sing along with them. Quieter acoustic notes and a choir of ohm-like singing starts up the fourth and final song. The title is sung but otherwise the singing is without words. It's relaxing, quite tranquil and at some point I also believe it to be rather trippy, which is quite the journey we've taken here from start to finish with these various, yet impressive overall, sounds. The way in which they are connected tells a story and that is not something you often see in music as much these days. Lyrically, to me, these songs feel conflicted. He sings about how he wants a family, about how he wants her, about how he wants all of these things. To me, it feels like these songs are about regret- at least the first two. And there are some great quotes out there about regret and how you have to kind of go for it when you have the chance, but this feels like a different kind of regret. It's not the "I really should've done that when I had the chance and I regret that I didn't" as much as "I did it and it didn't work and now I regret it". It's when things don't work out and it's beyond your control, which can be the toughest pill to swallow but this music helps to ease that pain for me.